15 Storey Hotel Built in 6 days?! Only in China . . . 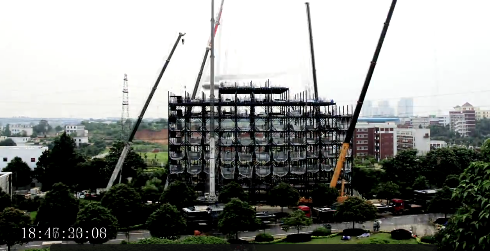 It took just six days to build the Ark Hotel, a 15 storey building in Changsha, China, earlier this year. Okay, you’re thinking, it must also be the crappiest hotel ever made. The hotel is level 9 earthquake resistant, sound-proofed, and thermal-insulated. Its air purification efficiency results in air that is twenty times cleaner than that outside. It used six times less material than a traditional building, and is five times more energy efficient. Its construction waste was only 1% of the entire building. I guess the speed was all based on prefabricated construction models, and undoubtedly, many cheap labourers. The foundations were already built, but still! !